All products sold and manufactured by Kartek Off-Road are for off-road use only. Kartek Off-Road does not accept responsibility for improper use, alterations and installations of any products purchase from us. Non-stocking items require a special order request to be made. If the item is paid in full at the time of purchase, the said item is still subject to any surcharges. It's the customer's responsibility to pay the difference in the cost caused by a surcharge. If the difference is not paid, the customer may be subject to a 15% handling fee and the remainder of the original balance will be refunded. KARTEK.COM does not list all available product lines or items of Kartek Off-Road, but instead serves as a general guide of available products. Direct contact with a staff member of Kartek Off-Road serves as the only way to find the current availability of any products. We make every effort possible to keep our prices current on our website. Pricing on KARTEK.COM is subject to change at any moment without notice. All pricing is listed in US dollars. Dealer inquiries are welcome. Errors on KARTEK.COM and any ads can and do occur. We make efforts to avoid and correct them when they occur. Prices, quantities, descriptions and terms listed on KARTEK.COM are considered as advertisements. Any purported purchases made by you through Kartek or this website are subject to review and acceptance by Kartek Off-Road. Orders are processed Monday through Friday during normal business hours. Domestic US orders will be shipped UPS or FedEx ground. However 3 Day, 2 Day and Next Day shipping are available. USPS is used to ship small orders to PO Boxes. Freight carriers are available for large orders. International orders will be shipped by UPS, FedEx, DHL or USPS depending on availability to your country. Freight carriers are available for large orders. Shipping on all orders is to be pre-paid, and we do not accept C.O.D. (Cash On Delivery) orders. Orders placed Monday through Friday will be processed within the next 48 hours. Orders placed on Saturday and Sunday will be processed the next business day. If an order will be delayed or has items that are backordered, we will do our best to contact you. If you received an item that is damaged, defective, missing, wrong item, or an incorrect quantity then call us immediately at 951-737-7223. All returned parts are subject to a 15% handling fee. Any unused merchandise in the original packaging may be returned within 10 days of the original purchase date. There are no returns on any and all electrical items, coil springs, special orders, sale items on discount, discontinued items and limited offer items. No returns will be accepted of damaged or used items. 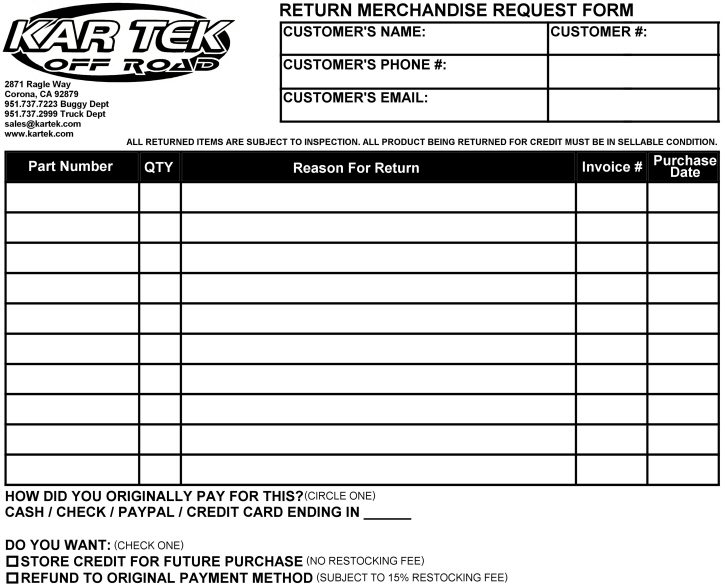 No returns will be accepted without a the return form below. Include the original packaging and a copy of your invoice. A return form must be included INSIDE your package so we know who the package came from. If we don't know who the package came from, we can't refund you!